Kipas booth at the last edition of Denim Premiere Vision. 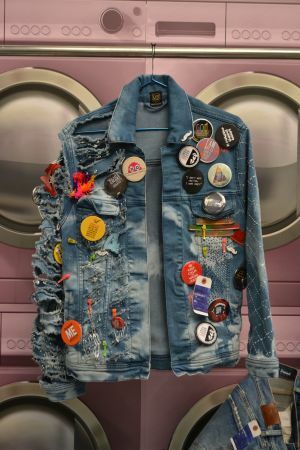 Kipas, Turkish denim manufacturer, and Fulgar, Italian high-performance man-made fiber producer have launched two new series of sustainable denims during the last edition of Denim Premiere Vision incorporating man-made, though ecofriendly, fibers. The new Peta by Kipas denim is made with Q-Nova by Fulgar, a fiber made with 99% recycled nylon whose production requires very low water and electricity and is certified according to the Global Recycled Standard (GRS) Eu Ecolabel and Oeko-Tex STD 100. Kipas also wants to further develop new eco-friendly washes and sustainable finishes for these fabrics. This fabric is extremely soft-touch, lightweight and comfortable on the skin. Also newborn is Lana by Kipas, a new denim employing Fulgar’s new Evo yarn. This fiber, also OEKO-TEX® STD 100 certified, is derived 100% from biological sources, and also derived from castor oil seeds that grow in arid areas not given over to agriculture. For this the basic biopolymer in Evo has no repercussions on the human food chain. Lana by Kipas, a new denim employing Fulgar’s new Evo yarn. The fiber has natural odor-control properties and is naturally elastic. Therefore Lana by Kipas denim has significant breathability and wick-away moisture control properties, perfect characteristics for denim garments that can be worn every day and as athleisure items.